We had our 4th annual ice skating event on New Years Day. It is a fun tradition we plan to continue. The kids have SO much fun, and are getting to be quite good on the ice!! Even Carson did AWESOME! 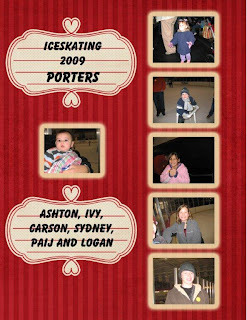 I of course with the other mama's (and my dad) stayed off the ice with the little ones and tried not to freeze!! What a fun memory!! p.s. thanks for the scrap book page, MOM!! love it! !